Last year, at an event for the Chicago Symphony Orchestra, I began chatting with Jeong Im Herbert, the wife of David Herbert, the Chicago Symphony Orchestra’s principal timpani player. She told me she was a painter, and we discovered we shared a mutual fascination with clouds. Of course she had her mobile phone with her, so when I asked if she had photos of her work she tapped into her website and I was immediately blown away by the beauty of her images, the astounding technical prowess evident in her photo-realist canvases, and the subtle mystical quality that emanated from them. A sampling of Jeong Im’s work is on view through Aug. 18 in the exhibit cases on the eighth floor of the Harold Washington Library Center. Her paintings deserve a far larger, and more unified, carefully lit showcase, but even under somewhat less-than-ideal circumstances the brilliance of her work is clear. First, the two large (72-by-72-inch), densely colored cloud paintings, both inspired by the skies of the Hawaiian island of Maui. One, “Blue Cloud,” captures the shape and movement of a great white formation afloat in a radiant blue sky. The other, “Sunset Cloud,” is a powerful explosion of golden light that brings to mind the fabulous skies of that 16th century Italian master, Titian. 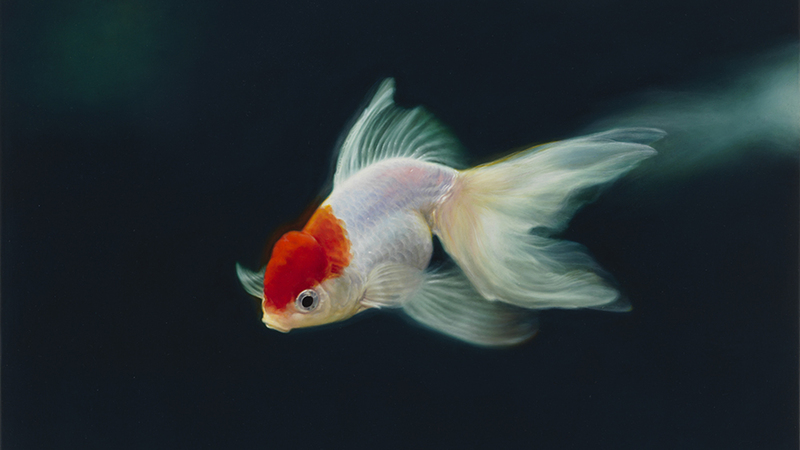 And then there are the goldfish – a series of high-gloss paintings of these sea creatures whose skins seem to be made of light, and whose curving forms make you feel their motion through water. There is no vegetation around them. They exist in a sort of exquisite fluid suspension. The smaller works displayed in several table-like glass cases reveal quite a different side of Jeong lm, but it is no less remarkable for the way it captures atmospherics with the most meticulous accuracy and poetry. Jeong Im has an uncanny ability to capture the texture of surfaces in a way that is as precise as a photograph yet at the same time magically abstract. Her precisionism comes with an almost mystical dimension. So does her ability to reproduce texture – whether a bare wall, the light of a candle or the corks from wine bottles. Born in Seoul, Korea, Jeong Im (who until this show used her maiden name, Yi) holds masters of art degrees in painting from the San Francisco Art Institute and Hongik University in Seoul. She has had numerous solo and group exhibitions in the U.S. and abroad, but this is her first solo show in Chicago. What she does do is make us see and feel that world in a far more intense way. “Around Us: Paintings by Jeong Im Herbert” runs through Aug. 18 at the Harold Washington Library Center (8th Floor), 400 S. State. For information call (312) 747-4300 or visit www.chipublib.org.